With the digital revolution, the business landscape is changing and has widespread implications for operations - ranging from data integrity to compliance. To survive and grow in this age, simplifying and streamlining process workflows needs to be a top priority for organisations. It is in this vein that Canon unveiled the new Generation 3 Multifunction Devices, reinforcing its philosophy - “Business Can Be Simple”. These products have been launched to streamline workflows and digitise documents - helping your businesses innovate and optimize at scales previously unheard of. A simple yet versatile Multifunction Device or MFD is possibly the most useful device for any business or organisation to invest in. Not only does it improve office productivity and versatility due to its ability to copy, scan, print, and fax, but it also saves space as all those tasks are handled by a single device. But choosing the right MFD is no easy task and a quality MFD is vital as it can offer a substantially higher ROI to businesses, all the while simplifying the way organisations conduct business and improving their workflow. The entire lineup is designed to meet the needs and requirements of various businesses. All of them adhere to six pillars, which not only ensures optimal value, but also helps with security, device management, workflow efficiency, reliability and sustainability. These devices are equipped with the features that help ensure data security, save energy, and improve workplace efficiency. In other words, it aims to make business simple. One of the most important aspects of any business is maintaining workflow efficiency. Workflow efficiency of a particular employee is directly related to overall office efficiency, which in turn would impact the revenue generated on any particular day. The MFDs offers a unique personal experience wherein individuals are able to customise the device settings to cater to their own requirements. This enables users to actively make the most of their device as it would offer a personalised environment for optimised workflow, based on the features a user is most likely to use. The MFD is also smart enough to skip any blank pages while scanning the documents .This is further improved by the efficient management of multiple MFDs. The new lineup of Canon MFDs come with a cool new feature (optional) called ‘Follow-Me’. This nifty feature allows the MFD to work in tandem with other devices in the network. This lets anyone in the network send a print command to any connected device. So, employees can print documents from the closest MFD, without walking all the way to specific printer. Of course, with connected device, the need to ensure security is of utmost importance. While a connected office might increase office efficiency and productivity, it also increases the chance of a security breach. Leaked or stolen documents might become a pretty costly mistake down the line. In order to ensure security, Canon MFDs use hard disk encryption technology as well as a dedicated chip for enhanced security. There is also a Forced Hold Printing feature that ensures that a print command isn’t carried out unless the user walks up to the machine and releases the print. On top of this, there is a feature that reminds users to retrieve the originals after scanning by either an LED light or an audible tone. This is quite helpful if the user is scanning sensitive documents. However, with such focus on security, it’s natural for business owners to worry if such an MFD is too expensive for them. Canon’s MFDs aim to offer a better ROI in the long run. Besides increasing ROI by improving workplace efficiency, the devices themselves are very efficient as well. Canon’s MFDs are designed to eliminate any unnecessary use of ink. The devices themselves offer a low cost for each copy as well as a lower overall running cost for the toner and drum unit. Furthermore, the Canon MFDs feature parts that last longer before they have to be replaced. Prints can also be restricted per department/user so as to limit wasteful printing. In order to save on power, there is an Eco Sleep mode that automatically puts the MFD to sleep when not in use. Of course, there have been times when a focus on cost management has come at the cost of reliability, but that isn’t the case with Canon’s MFDs. In any office, everything needs to work smoothly in order to ensure optimal workflow efficiency. However, a single flaw could lead to a backlog of work. That is why it’s important to ensure that any device in the office is reliable and is able to work all day, every day. Canon’s Generation 3 MFD’s come equipped with the Vertical Paper Path technology. Unlike traditional S-path technology, the Vertical Paper Path technology is designed to reduce paper jams, which ensures that workflow is not hindered. To make toner and paper replacements easier, the MFD can show videos that walk the user through the whole process. And of course, Canon has a strong service network that covers all of India. In this day and age, there is an inherent need for offices to be sustainable and cater to the needs of the environment. Canon’s new MFDs ensure that productivity doesn’t hamper sustainability. The MFD also has a stapling unit available as an optional accessory for stapling sheets of paper. However, instead of using a metal stapler, the device uses pressure to bind the sheets of paper together. This is not only eco-friendly, but also offers more compact document stacking. The devices come with On-Demand fixing technology, which reduce power consumption, while increasing output at the same time. This helps lower the MFD’s overall carbon footprint. Canon’s adherence to these six pillars ensures that its MFDs offer consumers the best value for their money. With these six pillars in place, business owners can rest assured that the Canon MFD they are purchasing is the best in its class. You can learn more about Canon’s Generation 3 Multifunction Devices and how they can help your business by clicking here. Disclaimer: Some of the product features mentioned in the article may be optional and available on select models only. 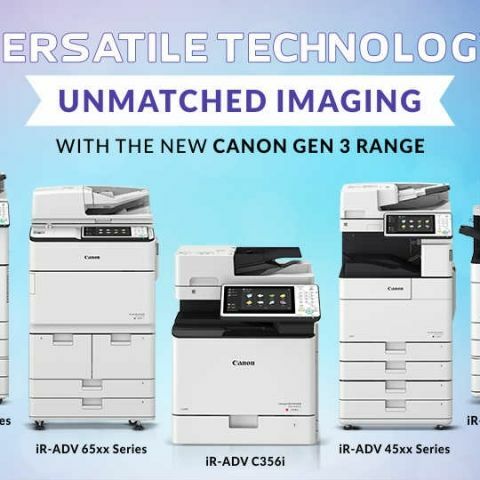 Contact Canon to know more about the standard and optional features available with the Generation 3 MFD’s. All additional accessories (software & hardware) are optional, as per the user’s requirements. The image used is for representation purpose only.